NTSB Investigating PG&E after another Gas Line Explosion. Up to 100 people displaced after another gas line explodes into flames in a San Francisco neighborhood. Pics and video from the aftermath of that scene. Info on the drone footage. I got permission to fly but could not fly directly over the site. I only went up to 111 feet to play it safe. On Wednesday, February 6th utility crews struck a natural gas line in the Jordan Park neighborhood in San Francisco. It immediately erupted into flames scorching nearby homes or apartments. Up to 100 people have been displaced by that disaster. Pacific Gas and Electric says they received the initial report at 1:15pm, but the gas did not get shut off until at least 2 hours later resulting in the major loss of people's homes. The National Transportation and Safety Board decided to launch an investigation because of the large amount of damage. According to Jennifer Homendy, a National Transportation Safety Board member, they are investigating because of the length of time it took PG&E to shut off the gas. PG&E says a representative from their company was on site immediately after the explosion and had been assisting first responders. PG&E also states they had to dig through the ground with their hands to get to the shut off valves. The NTSB has removed piping involved and will send it to a lab to be examined. 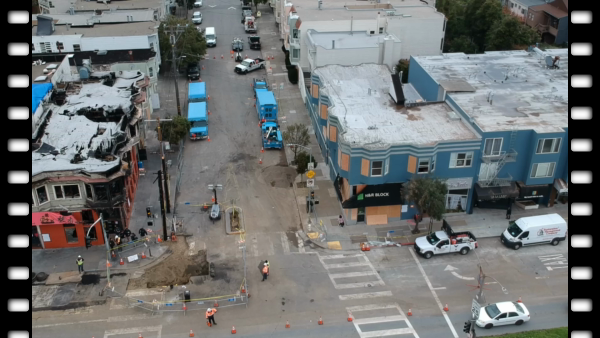 §The gas line explosion occurred at the intersection of Geary and Parker. §Many people were displaced after this incident. §The NTSB and the FBI were on scene Friday February 8th. §The business known as Hong Kong Lounge II is a total loss. §NTSB spokesperson arriving on scene. §Investigators pointing to ground zero. §Aerial Video of gas line explosion site.